The morning of the 29th of September began, as most mornings do on St Agnes, full of hope. We were 6 days into our 2 week stint at Roseveer Cottage, and our evenings were spent discussing American birds and favourable weather systems from previous years. I had high hopes for the trip. A cold front had passed the previous night, and we were well into the initial wave of south westerly winds. Rain overnight had cleared, and a bright morning was unfolding on St Agnes. I had spent the first half hour of light birding my way down to Wingletang. Checking areas of cover, I'd had a Pied Flycatcher and a Firecrest in places I hadn't the previous day, which inspired some slow and concentrated birding, lots of pishing and being methodical. After nothing else of interest for an hour or two, I gave in to just walking about enjoying the scenery and more common migrants - a group of white wagtails held some particularly good-looking individuals and I began photographing these, and one or two Wheatears. 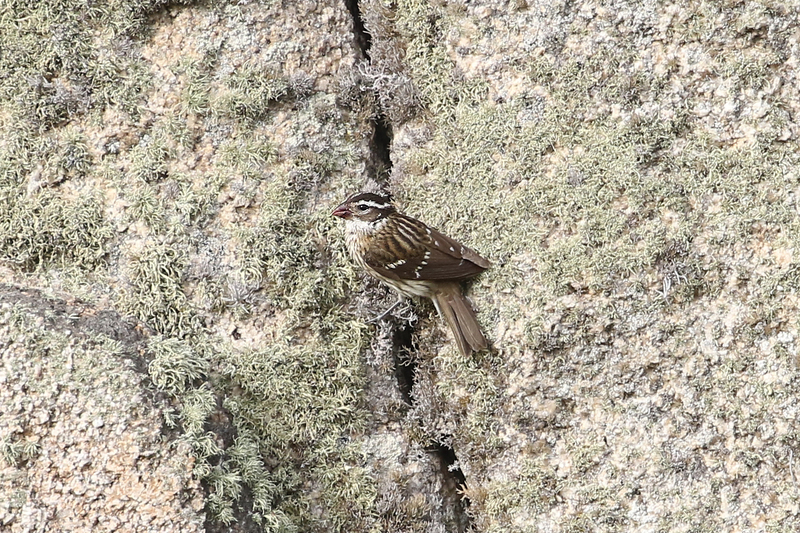 I had bascially 'given in' to another day of walking around the beautiful island, not really seeing much, when a bird flew up out of cover onto an exposed granite ledge. The obvious features from a distance of about 5 metres and with the naked eye were the contrasting areas; a dark bird with a bright white supercillium,white median crown stripe, white tips to the median and greater coverts,and pale below, the size and shape seemed really at odds with birds i'd expect to see on that headland-type habitat. I quickly got my bins on it and WHOA!...a Rose-Breasted Grosbeak, turning a blackberry over in its huge pinkish bill and looking totally out of place on the lichen-covered granite boulder. I took some record shots and then watched it again in the bins for 10-15 seconds. the mantle streaking looked amazing and i noted the white tips to the tertials - somewhat of an alien looking feature to me. fine streaking on the buff and white underparts and chest It dropped back down into cover of bramble, bracken and pittosporum. The next few minutes are a kind of dreamscape memory, almost like a cartoon or something - I had seen the bird well and was looking at the back of my camera in disbelief, I knew i had to get other people on it, and tried my phone but there is no signal on this part of Wingletang. I had to leave the bird, this felt like the best and worst thing to do but had to be done. 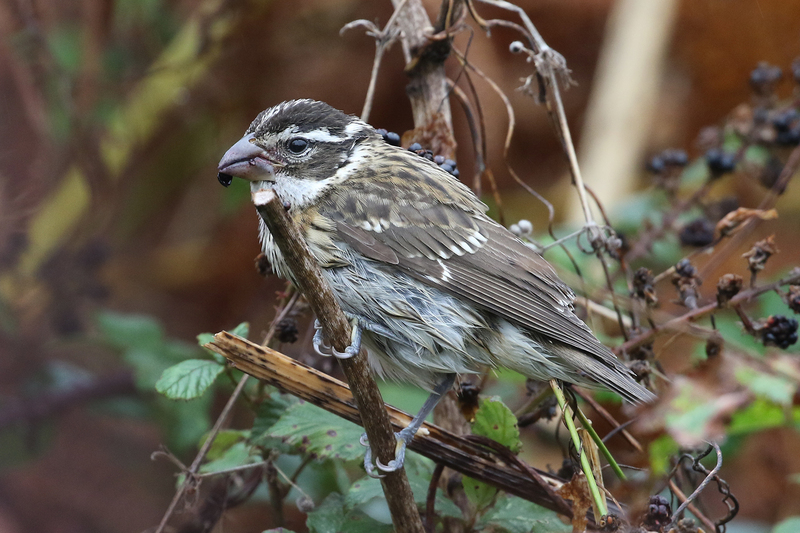 After running 200 metres towards higher ground I eventually got signal and rang house mates; Laurence Pitcher, Lee Amery and Graham Gordon, blurting out "I've found a Rose-Breasted Grosbeak" to each of them one by one, as well as stammered directions. After 5-6 minutes, LP arrived after an athletic sprint from the other end of the island. In a few more minutes, the others plus more regular St Agnes birders and locals were present, but the bird wasn't to be seen. An hour or so later and birders from St Mary's were arriving and the bird still missing. Although pleased to have found it, I had a real worry it wouldn't be seen again, and as most thinking was that it had recently arrived before my finding it, it would seek the cover of the interior of the island. Eventually it was pinned down to a couple of spots near the post office and to my knowledge, every body saw it well. It stayed around for another 2 days, and the last I saw of it, it was incredibly tame, hopping around on the path, feeding, and giving views down to 5 feet away! This tameness I'm sure had something to do with it's disappearance - there are a few wily old cats in the area, one of which was rather expertly 'missed' by a stone thrown by St Agnes regular Paul Wright after it had seen the Grosbeak sitting there munching away. 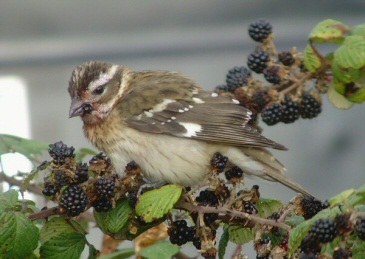 This was the first of a run of rare North American birds on the Scillies so far this Autumn, a completely new bird for me and I'm very glad to be part of what will hopefully be a very memorable year.